Vena vAllure is designed using high-quality polycarbonate (PC) with metallic finishing to provide the exclusive premium look. The unique textured design on the side adds grip to your Galaxy S7 Edge. The beveled volume and power buttons are carefully crafted to maintain the same great tactile feedback from your device's buttons. The high-quality shock absorbent thermoplastic polyurethane (TPU) does not stretch out over time. With CornerGuard TM technology and unique pattern, Vena vAllure protects your Galaxy S7 Edge and disperses the force from shock and impact through the TPU case. At just 2.8mm thin and less than 1.5oz, the slim and stylish profile of Vena vAllure protects your phone with minimal bulk and complements the essential look of your Galaxy S7 Edge. 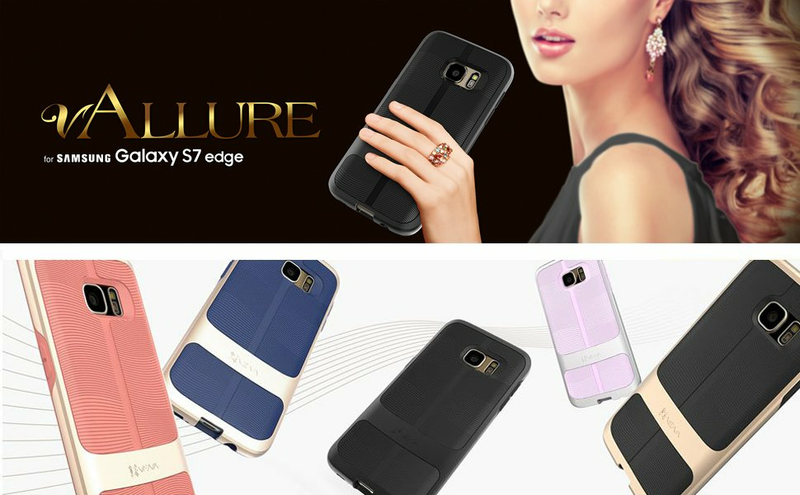 Vena vAllure case is reinforced with precision cut-outs to suit the Galaxy S7 Edge and provides effortless access to all ports, buttons, and features. Compatible with Samsung/Android Pay, wireless charging, and NFC technology. VENA CASE Review by Tito T.
I love the color and feel of this case. I normally never leave a crappy review, but, I feel it necessary on this. I got the case, very pretty, but flimsy on the hard plastic piece. The edge by the earphone was sharp, and within a week it was so stained from anything I touched that no matter what I used to clean it with. I took it off my phone and won't use it now..
Not very protective at all. Easy to take on and off. Buttons are easy to push. Doesn't interfere with any of the phones functions. But it stains SO easy! My case is no longer coral or whatever shade of pink is was when I got it, it's like... brown. Lasted a long time. The small creases get dirt in it easily so it's a bit hard to clean. Overall it did it's job. Good looking case. I ordered it for looks. That did not disappoint. As far as the sides of the case, it is smooth, which makes it slippery in the hand. The hard plastic part is not tacky enough. The case slipped out of my hand twice in the first two days. Most should like the case. It did not fit me like I wanted. My case came as promised. It protects my phone great. I've dropped it a few times. This case is really pretty and protective. Easy to hold onto without getting in the way of the edge screen. For anyone that is questioning the quality of this product. Look no further read no further this product is of good quality I bought this yesterday January 7th and received it January 8th. I paid an extra $4 for the shipping I do have Prime but I go out of town every week for business so I needed it the next day. This is a great case, the color, the feel, the look, and the fit are all 5 stars. This also tells you what the customer service is probably like as well. I didn't have to call them but I'm sure if I did things would have been handled very expediently and professional. This case is of good quality, it just didn't give me that wow factor once I got it. I still use it and my boyfriend might get it as he eyeballed it.